From Brillance I knew that Marcus Sakey is into fantastic fictions. 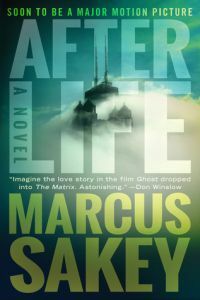 His new novel Afterlife is not connected to any past series of his, so I took the chance to read a current book rather than going on with Brillance part 2. Well, this new one is a hell of a ride and out of the ordinary story that got my head spinning. In a very far sense it reminded me of Philip José Farmer’s Riverworld (the novel series is far better than any film based on it), which also was a mind-opener to me. Afterlife starts just like an “ordinary” thriller, with two FBI Agents, Will Brody and Claire McCoy, hunting a ruthless killer shooting innocent people seemingly chosen by chance. The first shock comes, when somewhat early in the story, Will Brody dies in action. A point, where I thought “WTF?”. But, he is not dead, or is he? And that’s exactly where the story itself starts. It’s not so much about catching the killer, but finding out about what comes after death. This is not a highly philosphical book, no need to worry about theoretical discussions. It’s a very pragmatic view on the world as is and its continuation in the afterlife. Of course, it finally is about catching the bad guy, when it comes to the action part of this novel. But the really interesting part is about how everything seems connected and how people cope with the unexpected situation they find themselves in. Really cool read.